The Best Teacher Podcasts from thousands of Teacher Podcasts on the web using search and social metrics. Subscribe to these audio podcasts because they are actively working to educate, inspire, and empower their readers with frequent updates and high-quality episodes. Teacher Podcast newsletter is a comprehensive summary of the day's most important audio podcasts episodes from the best podcasters on the web, and delivered to your email inbox each morning. To subscribe, simply provide us with your email address. Facebook fans 86,352. Twitter followers 130,902. About Podcast The Teach On, Teach Strong Podcast is all about providing free personal development for teachers. This podcast is a movement with it's sole aim being to support fellow teachers emotionally and mentally to help you succeed in teaching so you can fulfill your potential and keep making a difference in the lives of young children. Facebook fans 730. Twitter followers n/a. Texas, USA About Podcast Teach Me, Teacher is a podcast for educators where teachers discuss topical, informative and inspiring subjects. It is a show for anyone in the field of education and will feature teachers and administrators from all over to offer their unique perspectives. Facebook fans 36,525. Twitter followers 865. Facebook fans 164. Twitter followers 611. About Podcast This podcast is full of creative teaching strategies, classroom ideas and inspiration for middle and high school english teachers. Betsy Potash from Spark Creativity presents new ideas for immediate classroom use, making it that much easier for busy teachers to stay creative in the midst of their busy lives. Facebook fans 807. Twitter followers n/a. About Podcast Teachonomy Talks is a podcast is for busy teachers who want to be inspired, encouraged and empowered each week. Facebook fans 649. Twitter followers 8,602. United Kingdom About Podcast Teacher Toolkit supports teachers across the world with resources and is one of the leading and unique teacher-voices within the U.K.
Facebook fans 24,524. Twitter followers 205,383. About Podcast The Simply Teach Podcast is a podcast by teachers for teachers. The goal of Simply Teach is to encourage classroom teachers right where they are with practical and simple tools to use in your classroom. About Podcast This is a podcast for teachers who are interested in learning more about inquiry based learning and how to implement this teaching strategy into their classrooms. Facebook fans 2,041. Twitter followers n/a. Facebook fans 315. Twitter followers 998. About Podcast Those Who Can is a podcast for teachers, talking through all things educational. Each week we will be interviewing teachers and getting to know the stories behind their work in the classroom. From investigating the best and worst lessons that have been taught, through to discussion about pedagogical theories and techniques, this show is for all teachers looking to build and develop their practice. About Podcast Teacher's Anonymous is a podcast that shines a light on the inner workings of a school and the secret lives of teachers. Teachers, parents or former students will laugh and cry along as the mystery hosts regale tales of and experiences always under the cloak of anonymity. About Podcast Language Latte is a conversation about teaching world languages. Becky Morales looks at research and speaks with teachers from around the globe to find out the best and most efficient methods, materials and tips to help students gain fluency. Facebook fans 19,228. Twitter followers 18,008. Australia About Podcast Teachers Education Review is a podcast that takes a look at educational issues in Australia and around the world. Hosted by teachers from primary and secondary schools explore the implications of educational policies, teaching practices and international events that impact on teaching and learning in Australian classrooms. Facebook fans 413. Twitter followers 3,039. Facebook fans n/a. Twitter followers 166. About Podcast Designed to share yoga teaching related topics in the areas of technique as well as personal and professional development. Think of it like having a cup of tea and a chat with a colleague yoga teacher. Facebook fans 4,367. Twitter followers 11,985. Facebook fans n/a. Twitter followers 577. About Podcast Education podcast for teachers, by teachers, to celebrate and share the impact of teaching, one story at a time. 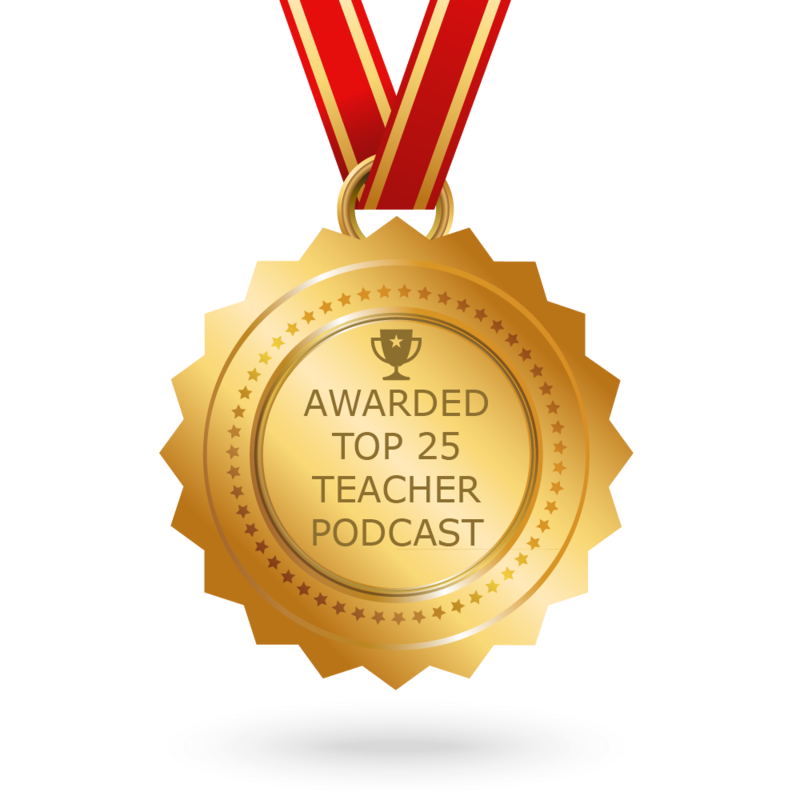 CONGRATULATIONS to every podcast that has made this Top Teacher Podcasts list! This is the most comprehensive list of best Teacher Podcasts on the internet and I’m honoured to have you as part of this! I personally give you a high-five and want to thank you for your contribution to this world.